The Official Realism Overhaul Craft Repository. 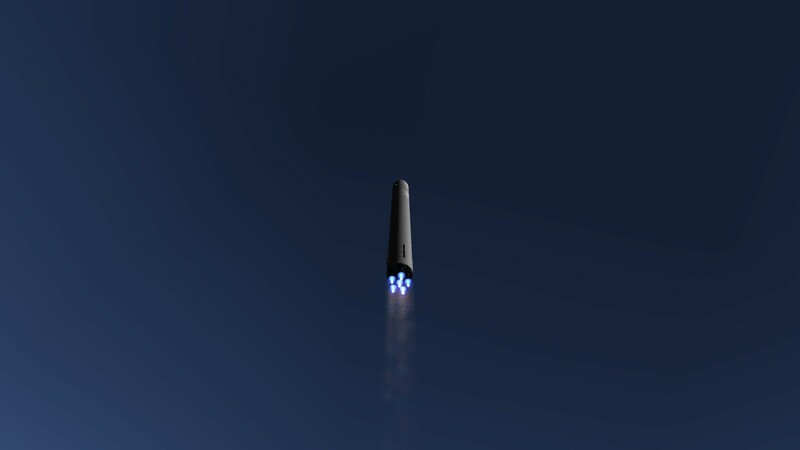 Recently, I have not seen a hint of any Realism Overhaul rockets. Searched around the forums, found nothing but planes. So you know what? Screw this, let's make a repository right now! 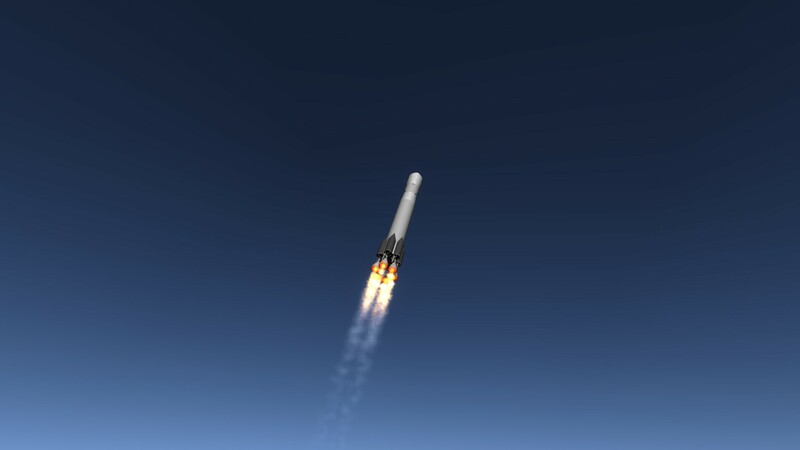 Post your rockets and spaceplanes (notice the relationship to space here. No atmospheric craft, we have FAR threads for that) here, see how far you've gotten in RO. Posting career-mode "stories" is also allowed. I'll post my craft here as soon as I'll get access to KSP. The Minotaur I, 40 tons to LEO. I'll try to post my Mu-II launch system this weekend. The surprising thing is that my Mu-II lifter is three times shorter. You should use AIES. It's perfect for Realism overhaul. 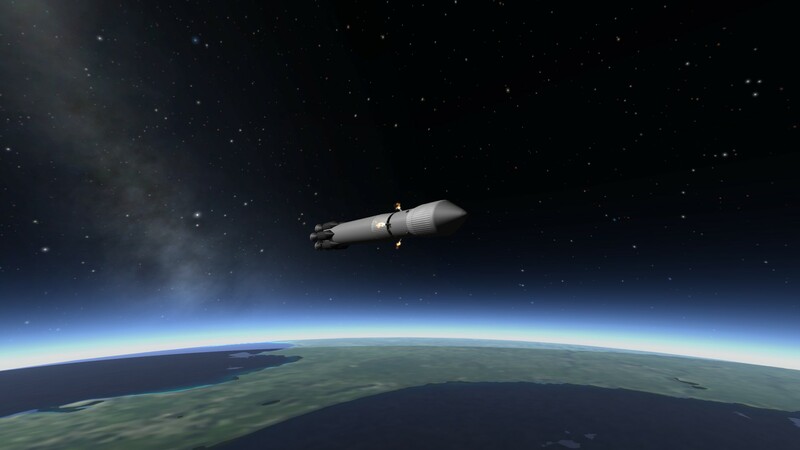 I also once made an experimental lifter, called LSX-I, that could make it to orbit, no problem. It was the size of one of your launch clamps. I figure I stopped being lazy, and started making imgur albums. Guess I'll bump this thread up. 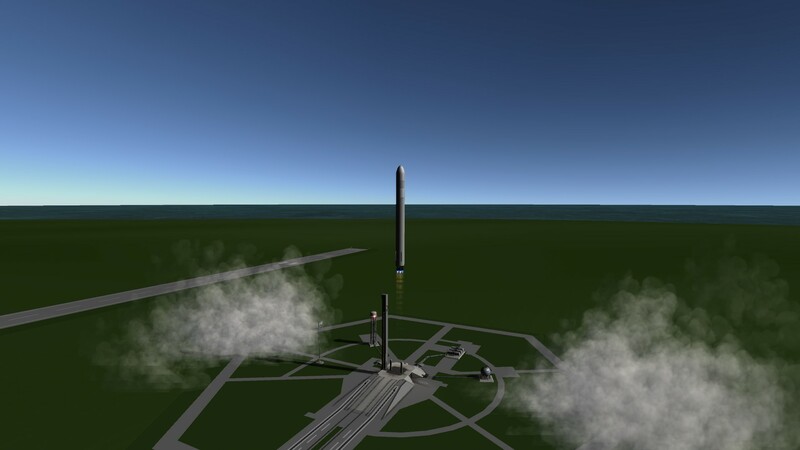 I proudly present the probably first Eco-friendly rocket in KSP History :P.
The reason, why it is eco-firendly, is, that it is using is LH2 and LOX (Liquid Hydrogen and Liquid Oxygen) as its main fuel. It is using 6 SSME (Space Shuttle Main Engine or Aerojet Rocketdyne RS-25) to get the payload to about 140km and a speed of up to 4km/s. In order to maintain stability, I added very small, but long fins, giving it just enough stability. I also tried to avoid high aerodynamic resistance, which gives it a smooth look. It can carry up to 20 tons to LEO. I hope you like my spacerocket. Thank you! Your spacecraft is pretty long and I can imagine it wabbling in flight. You should try increasing the diameter of your spacecraft. I like the name of the spacecraft . One sentence pretty much repeated itself. The SSME is a pretty expensive treat. I don't use it until I can guarantee reusability. Also, my rocket is rock-solid in flight. The first stage has a diameter of five meters, and the second stage has a diameter of 4. How's mine for efficiency? I just realised, that I commented on the wrong post. I was supposed to comment on Mad Rocket Scientist 's post. I actually meant his spacerocket. What do you think of my rocket? Your Delta V, especially on the upper stages is really high. How have you done that? Is it maybe because I'm used to LH2/LOX engines? And about the SSME: Im currently working on a ECO-1A version of it, whoms 1st stage returns back to the space center (just like the Falcon 9 by SpaceX). @Karol van Kermin. Yeah, that's what I'm thinking. 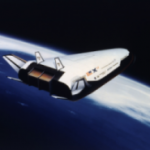 Make the expensive SSMEs return back to Earth in one piece, and you got one of the best launch vehicles I've seen, especially because of that high payload capability. Do you have any booster configs for that thing? Also, I get high deltaV on my Sheat OMB because it is already made for orbital use, so it doesn't need high twr, thus having more fuel capacity. Also, it uses the efficient AJ10. 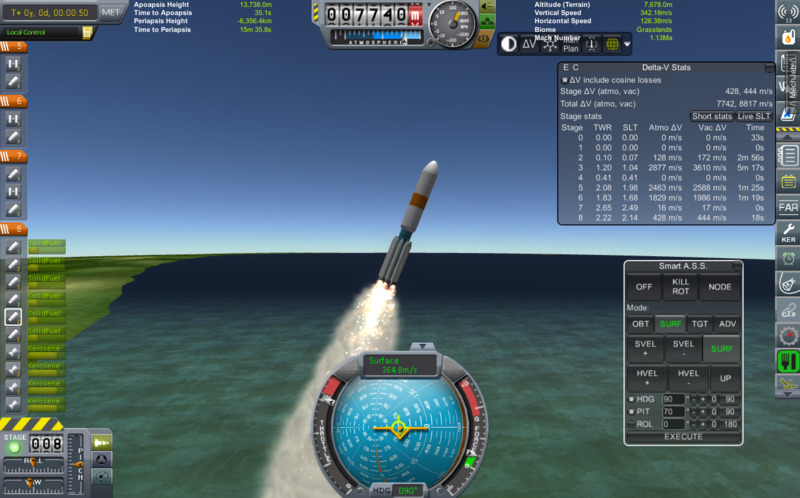 My Markab 2nd stage isn't that high in DeltaV, because it uses a higher thrust Russian engine. I have another lifter, though, in which the DeltaV emphasis is on the second stage instead of the first, but that will come later. I'll give you some tips: if you don't use the SSME (which is a feat of an engine in itself), use any Russian kerolox engine. They are known for being small, but extremely powerful for their size. Also, you should check out some more modern engines, like the Merlin 1D or J2X. There are some nice engines in the SSTU mod, you should get it. Very nice launchers. You should keep updating them here. I'd like some planes for RSS/RO... especially aircraft replicas but alas, there are none that I know of. Hmm. Not many people create planes for that. You can find some of the absolute best replicas on @winged's Real Airplanes thread. 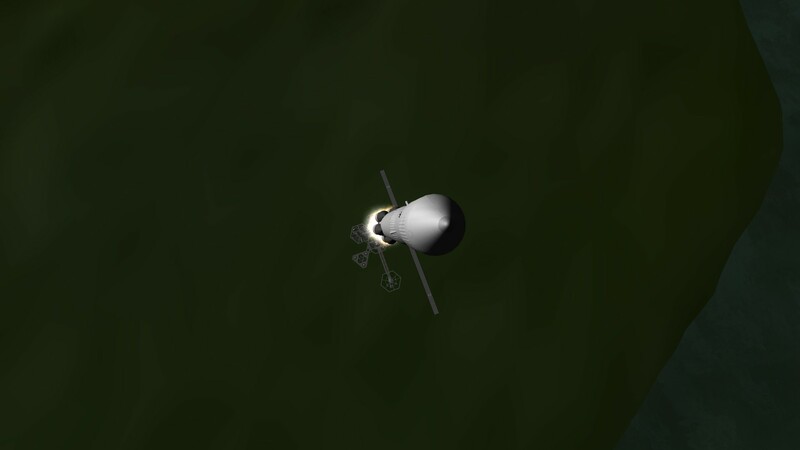 I had Issues making the 1st stage reuseable, as the SSME has only 1 Ignition available (You can see at the start of the SSME's the sparkles on the launchpad, which ignite the engine). So the ECO project is cancelled. My next project is either a very cheap rocket or a reuseable SSTO, but thats a very difficult task, so I'll start with the cheap rocket first, maybe even making it reuseable. Oh, I have some very small rockets for you. Evryone would love to see your spacerockets! Doesn't look like it, by the size of this thread. I'll upload them as soon as possible. I had to start a new save a few weeks ago, so I am quite low in quantity. Im currently looking for a "ignition mod", in which I would like to have the ability of re-igniting my engines with the help of hypergolic propellants or pyrophoric substances, such as triethyaluminium (TEAL), which is currently used by spaceX in their falcon 9 rocket. 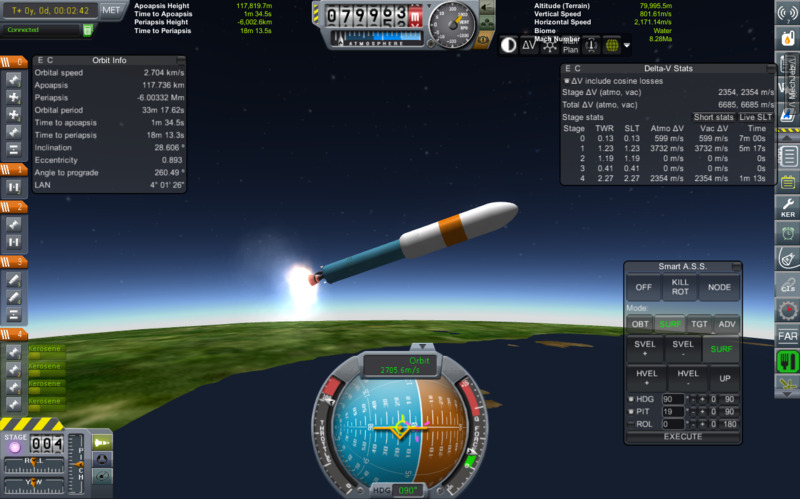 Currently, I cannot increase the amount of times I can ignite my engines, just like the SSME in my ECO-1 rocket. @Karol van Kermin Do you have any booster configs for that thing? The configs seem to be correct. The RS-25 engine is indeed an amazing rocket engine. And btw. : Is it true, that the RS-25 Engine is going to be used in the future SLS rocket? If yes, isn't it going to be pretty expensive, or are they going to have a possibility of recovering the expensive rocket engines? Im still waiting for your other rocket designs ! Great idea @Matuchkin: it's true that there is a depressing lack of RSS spacecraft in the spacecraft exchange. I would gladly showcase some of the hardware used in my RSS mission report, but they don't use real (as in, existing in real life, now) engines. 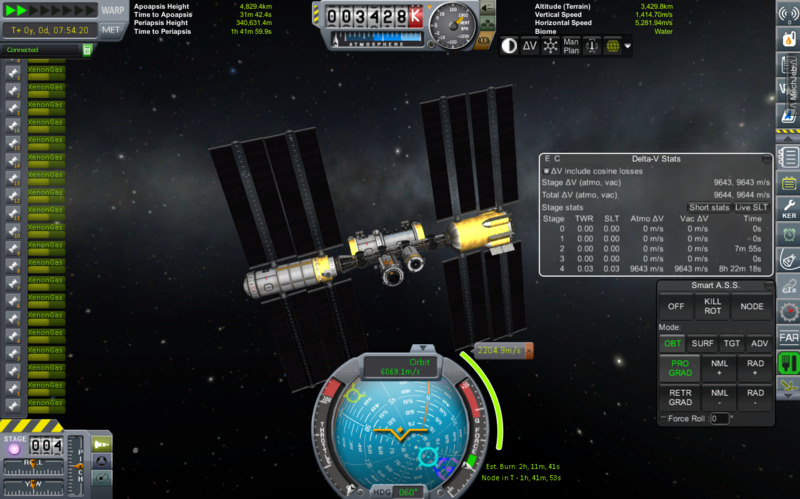 I mainly use stock or mod pack engines (Space Y, in particular) configured for real fuels. Do these still count as "realism overhaul" crafts by your definition? Well, I don't exactly know. I mean, the point is that we all know the stats for them. If they are realistic, and mirror real life engines, I'm fine with that. By the way, I broke a promise again. Said I would upload a craft, ended up forgetting when this thread went down. Sorry about that. I had some trouble with work, so I had to uninstall every game I had. 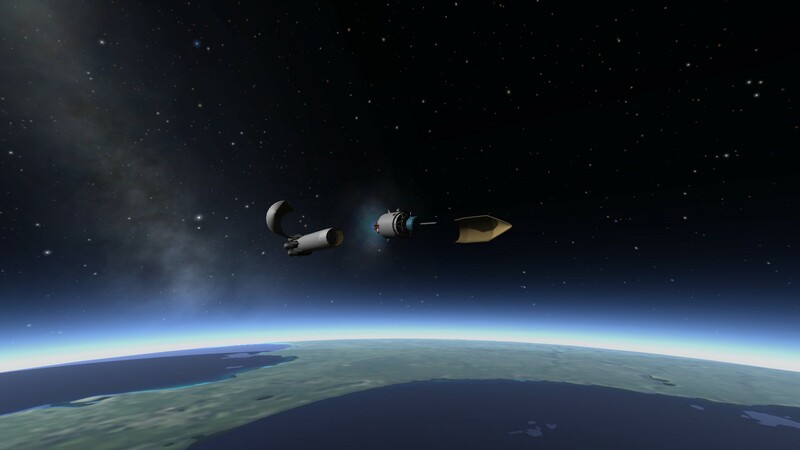 I'll get KSP again, I kept my save somewhere else so my designs are unharmed. Don't worry. Great thread! RSS crafts are hard to find on the forums, so please keep uploading more. But the reason why this thread isn't all over the place, is because not so many play RSS/RO. Ofcourse many do, a lot more play the stock system. ugh, dat sux! But I cant await to see some more amazing rocket designs! I love seeing other RO craft, so here are some of mine. Ill post more in the future. This is my ion tug Nautilus. 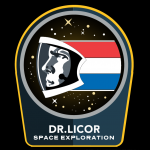 It is taking parts of my Extended Duration Lunar Analysis Base (EDLAB) from LEO to LLO (had/lab module, KIS equipment container with the solar arrays stored, and the life support module). The next trip will take the rovers which move people and have claws to move modules together, two landers which will bring the kerbals to the surface and back to LLO, and one more KIS module with parts for the solar array. I increased the thrust in each of the ion engines to about 2kn (I know its unrealistic, but I'm not going to wait years to burn). It still takes about 8 burns to complete TLI. My line of heavy lifters that use Kerolox engines is the Kronos line, and this is the peak of its development: The Kronos X heavy. 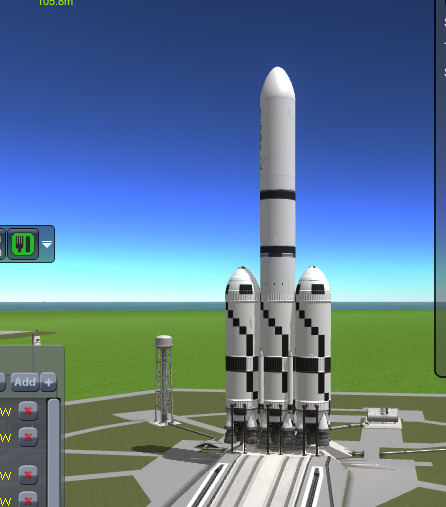 It can lift about 300t to LEO, has 15 F-1 engines, and 4 SRBs. 2nd stage is 5 J-2 engines burning LH2/LOX. The framerate on it is pretty bad, taking over 30 minutes to complete the 9 minute launch. 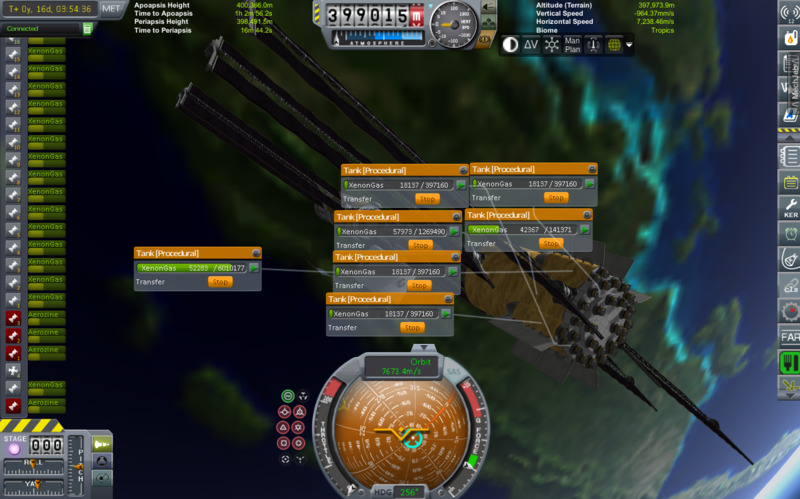 My Icarus line of launchers is used for small to intermediate payloads. Icarus I and II were were my first reliable launchers for small LEO satellites. Icarus III was used for over 40 launches of LEO comsats, and the troublesome Icarus sIV led to the incredibly customizable Icarus V series. 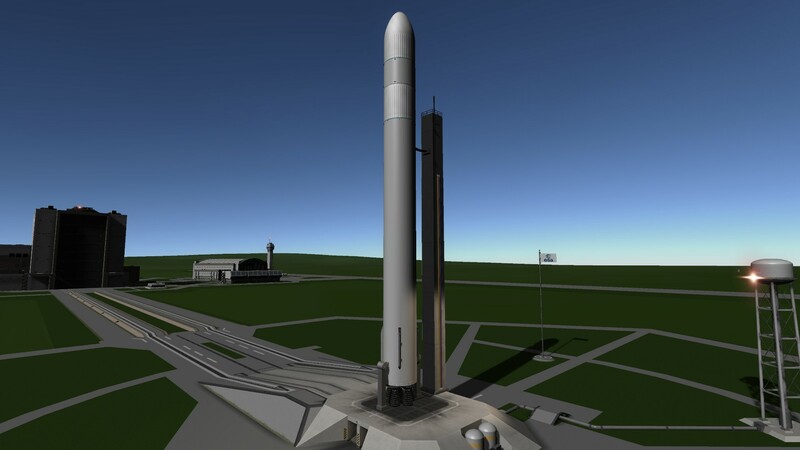 Depending on core engine choice, number and size of boosters, and size of expanded Centaur-X upper stage, it can lift between 4.8 and 16 tons to LEO. 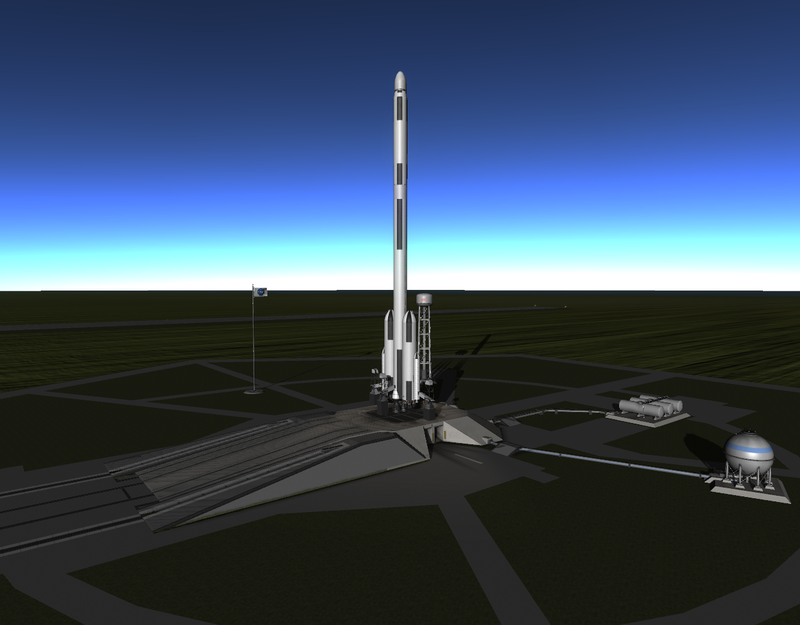 Icarus VI was a disaster, but the Icarus VII series is comprised of the I VII 795 (a big Delta II with an RS-25 main engine) and the I VII 791H (A big Delta III with an F-1A main engine and J-2 upper stage). 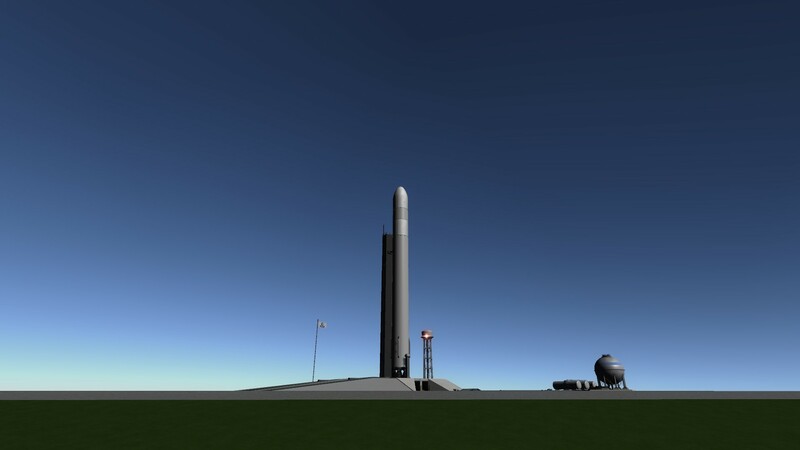 The pictures below are the launch of an I VII 791H with a resupply of 6 million xenon to Nautilus. Icarus VII after sea level booster separation and ignition of the vacuum-optimized boosters. 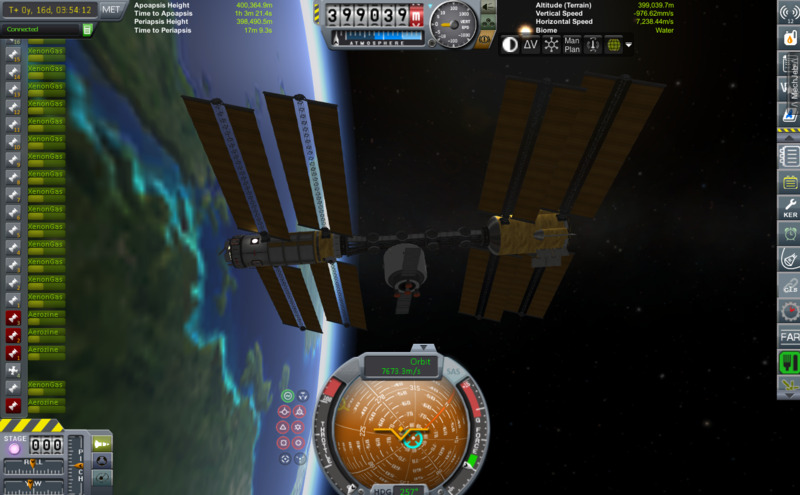 Xenon refill docked at the unmanned Nautilus. Things left for my next trip to the moon: I need to send up two Rovers, two landers, a KIS container module, and 6 kerbals. I'll post pictures of those too. 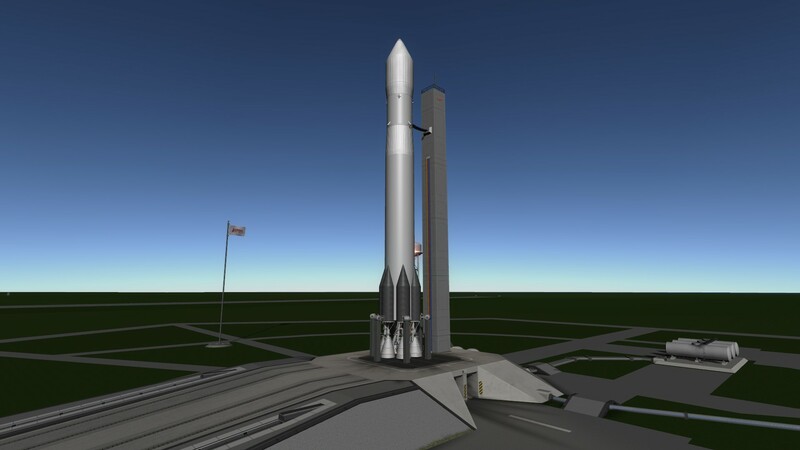 It will be another Icarus VII 791H, a 3 Titan 121s (RS-25 main engine and large boosters, and an Icarus V 594H. @kimjongspoon, not bad at all. It seems like you're far ahead. @Matuchkin, I started playing RO/RP-0 when Scott Manley started his series on it way back in the day. I've just moved my save up through the updates since, and I got to learn how the mods and everything work as they would occasionally break part of the save. Let me know what you think about my latest rocket! Thank you for your attention!